It's no secret around here that I am a big fan of female vocalists in metal bands and Tarja Turunen from Nightwish is my favorite lady. The interview was taken a couple of days before the band leaving for the North America tour and it's really interesting with info about their next album, the 2005 tour, her future plans and much, much more. This summer (2004) you were in Greece for the Rockwave Festival and performed between Metal legends like Queensryche and Judas Priest. How did that feel? Oh, it was an amazing experience to be playing in Greece. It was our first time there and the audience and everybody were really surprised with our live show, I think \[laughs]. Every time you visit a new country you’re always a little bit suspicious about how it will be but so many Finnish bands had already played in Greece and they told us it would be amazing, and it was! I’m very happy about our first live show in Greece. You didn’t play any songs off Angels Fall First and Oceanborn during your live appearance at Rockwave Festival. Was that due to your short time you had for your set-list? So you were supposed to play more, right? Your latest album, Once, has topped the music charts around the world and in my opinion it surely deserved it. It was a huge success especially for a heavy metal band. What were the elements in your opinion that made Once so successful? Oh, that’s a good question. Well I believe that it has to do with our background that we’ve already worked for like 7 years. We had created a fan base in so many countries around the world, so they already knew us but basically it’s a music business and there are new companies working with us very well. With the promotion and the hard work we have done, traveling around the world promoting the new album etc. All these campaigns you can get with the TV, the media generally. Then of course, we have a great album in our hands, so…\[laughs]. So I guess probably that also has something to do with the media. It’s a package you know, it’s a package and I think that we were ready to take this challenge. You’ve conquered Europe and the band is bigger than ever. Do you feel that perhaps your destiny lies with Nightwish after all? I mean, a few years ago your top priority was to be an professional opera singer. Not actually that. I’m a chamber singer, a lead singer when I’m making that kind of church music, I’m on my own lead concerts but my goal with Nightwish is still as long as we’re having a good time, as long as we’re doing this music with Nightwish I’m going to be the singer of the band. But on the other hand Nightwish needs to give me time to do my own classical career, I mean the thing with the concerts because I’m not studying anymore in order to be free and concentrate on all the concerts, the touring and stuff like that on my own. So this means that I’m still concentrating on those things too because they keep me going, they keep me healthy – mentally. I don’t think I’d be healthy if I only were a Heavy Metal singer. I am still concentrating on both things. Of course priority number one is Nightwish now. I know Liv Kristine (Leaves’ Eyes) is your favorite female Metal vocalist. She’s taken part in various projects. Would you consider taking part in any projects if you were proposed to do so? I’ve been requested by hundreds of metal bands to be part of their albums or side projects. Basically I’m not into that because I already am a singer of a Metal band so I don’t think I’d do something Metal again. But I am planning to do something that has to do a bit with Pop already. I feel my voice can fit in many things so it’s very interesting to combine things and music styles. In Once you’re using a much softer voice, less operatic. In my opinion it sounds much better than Century Child. Considering though that your area of expertise is operatic vocals, did you feel weird or perhaps uncomfortable? I feel very comfortable with Once because I have tried to change my singing style with Nightwish already since Century Child because Tuomas requested that, the songs requested that. Also it’s easier for more people to listen to this kind of voice. It has been hard work and I didn’t manage to do that on Century Child, I was not very happy with it. On Once it’s all very natural, how I’m singing and what I’m singing. But as I said, it has been really hard work because I’ve been a classical singer for the last ten years so it was hard to start over again and think of different styles. Of course I’m always singing with my classical techniques, I never sing with my poor speaking voice – I cannot do that anymore\[laughs]! So now I’m very comfortable with what Tuomas has done because he was able to write for my voice; it was also a lesson for him as it was for me. Many people consider Once to be a once in a lifetime album. How easy do you think it will ever be for Nightwish and especially Tuomas to top Once in the future? Are there going to be any singles released with those new songs? Oh we’re releasing a single called I Wish I Had An Angel from that song because we made a video. There are going to be some surprises too but not any complete plans for the future right now. Speaking of videos, Nemo was a great video and now I Wish I Had An Angel is on it’s way. Should we expect any other video clips? Do you think that video clips are the best way to promote the band’s music? So it will be part of the soundtrack. So no more video clips after I Wish I Had An Angel, right? Yes, no more video clips after that. I couldn’t help noticing that the entire theme and lyrics of the album were a lot darker than the previous ones. What inspired Tuomas and perhaps the rest of the band to take that turn? Well yes, the album’s completely more heavier and darker yet still I think that Century Child was like a shock for everybody to read the lyrics because it was really rough writing and deeply darkly emotional album. I think Once has more light in it. The lyrics are mostly from Tuomas’ diary; he’s really very honest with his music – he’s writing from his diary, his own experiences, ambitions, his own dreams.He’s like an open book! It’s amazing that somebody can write like that. Do you feel Planet Hell is the title that fits our world better nowadays? My idea of a perfect Nightwish DVD would include the band performing with the London Session Orchestra and I bet this has crossed your mind too. Any chance this might happen in the future? The London Session Orchestra is an amazing orchestra! They’re working so hard with soundtracks and things like that…so if it could work out, well it’s definitely our dream! We’re planning on having a world tour in 2005, in autumn, with the orchestra and the choir though! Nightwish is alone with the technicians, traveling; the crew will be working all over the world with the orchestra and the choir in big cities in Europe, South America, Japan etc. Yeah and it would certainly be part of a DVD. How do you feel that metal fans have been towards you all this time? Amazing. I mean, as a female singer in Heavy Metal…it’s not easy being a female singer in Heavy Metal. It’s not easy being a woman in Rock or Pop; you need to take care of your looks, you need to take care of your attitude. But for me when I entered the Heavy Metal circle people already knew my background, that I was not a Heavy Metal singer or Rock singer, they knew that I was a classical singer. I have kept that attitude and I have kept that classical side besides Nightwish and they know that. They really respect me and that’s amazing. It has been an amazing experience for me to be with Nightwish and tour around the world and meet people. They really appreciate what I’m doing and that’s what keeps me going! So do you think that people would have the same attitude towards you in other kinds of music, if you were Pop or just Classical? If you think about Classical, there are many Nightwish fans coming to my Classical concerts. It’s interesting for them to really hear my real voice. Yeah and they go wow, this is your voice? We only hear 1/3 of your voice in Nightwish concerts, so it’s interesting for them. So you see people with Nightwish t-shirts in your Classical concerts? I made some lead concerts in spring 2004, in three South American countries and yeah there were a lot of Nightwish fans attending these concerts! Yeah, I know. They’re like a selling product. They make something in a very short time and then they intend to be the very best in the world. Of course this is nothing I admire. I admire singers that are really hard working and decent in what they do. Studies always worked for me and I really do not envy people with a lot of money! \[laughs] I’m not such a kind of person myself so…nature is more near to me. Like most Finnish people I guess. I can mention some of my favorite Classical singers for you. There is Anne Sofie von Otter from Norway, she is a mezzo soprano and she is very good. Yeah, sure, sure…we’ve been around six years more than they have! \[laughs] That was very funny of them to say. With your North American tour on mind, how are things there? (The interview was taken a couple of days before that tour). Perhaps it’s due to the MTV industry of nu-metal. Yes and you should really be there to work hard for three or four months in a row and we have time to be there one month. It has to do a lot with promotion, it’s very hard for European bands to win the US. Can you see yourself having a family and still touring with Nightwish in say…ten years from now? Maybe you’ll be just a studio band? Yeah, maybe that or everyone of us will be doing something different and we’ll just be getting together again for some concerts or who knows. Nightwish has always been a band that doesn’t look or think much ahead into the future. Right now we only know what we have to do until 2006 and that’s enough for us I think. So should we wait for a next album soon? Next year maybe? We’ll really get back there, soon again I hope. We’re really anxious to see Nightwish not playing in a festival but on their own, with a full set-list and no technical problems. Well, I wish you all the best and hope to see you next year. Thank you, kind words mean a lot to us. See you all, soon! \[Some notes from Yiannis: When sometime ago a phone interview was arranged it was written in the stars that I would have to go through hell if I wanted to record the conversation. Cables didn’t work, the recorder refused to cooperate, my ancient dial-up modem wasn’t Voice enabled and a friend of mine rescued me with his own modem. After the interview was over, the recording software crashed too, but I recovered it from my temporary files. I think I even got some white hair when I saw the dreadful Microsoft warning. 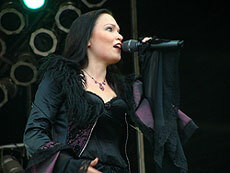 Anyway, it was definitely worth it since Tarja is the friendliest voice that has ever graced my phone. Thanks to Orpheus for transcribing the interview since personal problems kept me from finding the time.